Original photo of cells by Annie Cavanagh. 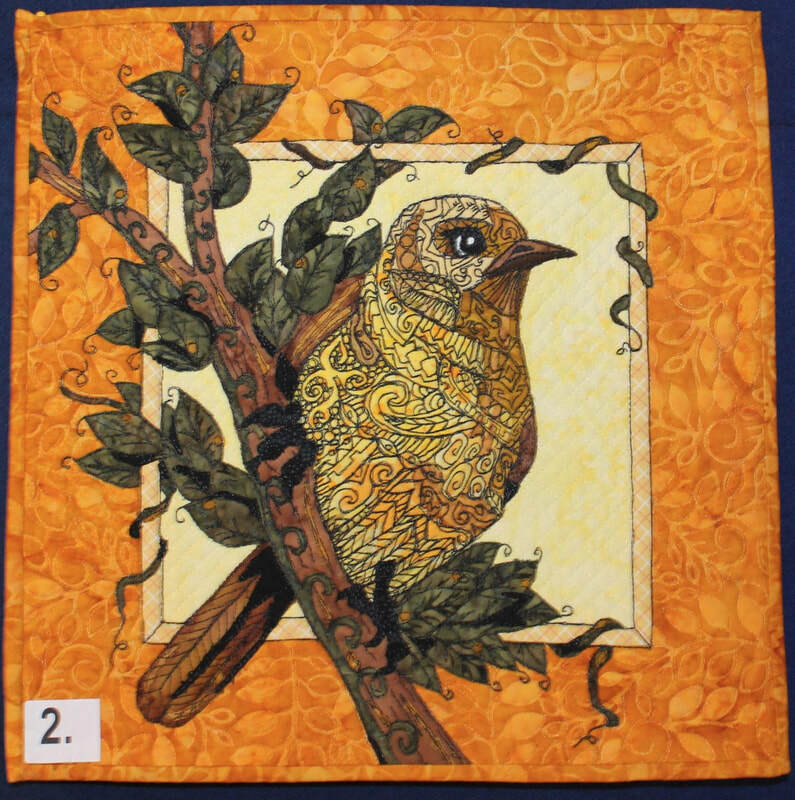 This quilt was made for the Aotearoa challenge 'Growth' winning a merit prize. When searching for a topic, I ruled out subjects I considered obvious. Many family and friends have been hit with the 'growth' of cancer, and this piece was an effort to put a positive spin on the growth we all despise. While researching I found a new treatment being used to make breast cancer cells rupture when growing. The name for this piece is called Prognosis Hope. The subject is an electron microscope view of breast cancer cells that are busy perishing. 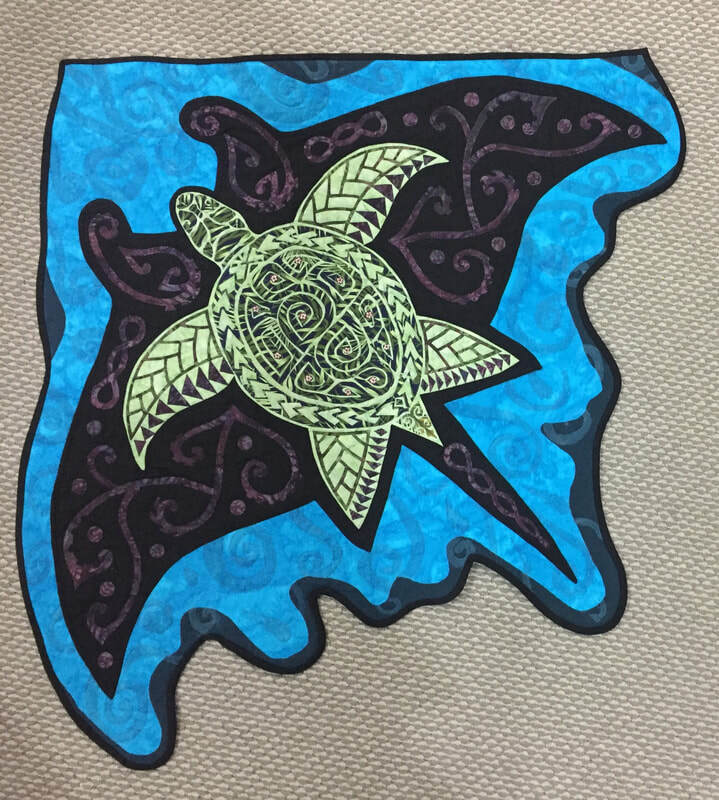 Photo used with permission- interpreted into fabric. The cotton fabric and batting sandwich formed a base for up-cycled (Salvation Army) wooden blanket shapes, which I dyed and covered with hand-felted fibres to 'paint' the shades. Machine quilting completed the 3-d effect. This now hangs in the studio of a close friend and breast cancer survivor. 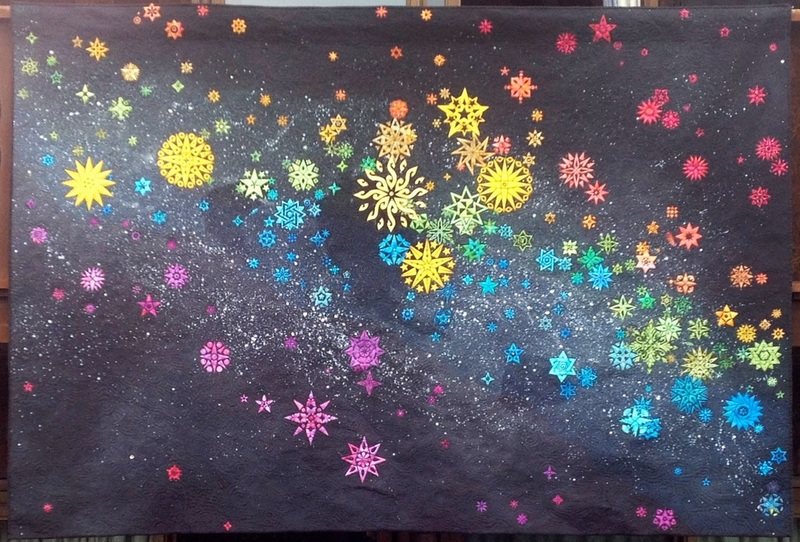 All two hundred and fifty fun-shaped stars were positioned, from measurements taken from an actual star chart. Brighter stars were given larger representations. The 'coal sack' and other dark spaces on the milky-way were included in the background with the Pointer stars and Southern cross in the largest yellow fabric stars providing strong visual emphasis. Ironically the Northern Hemisphere judges who presided at the World Quilt exhibition had no idea of our Southern sky and took issue with the inconsistent dark spots that remained unpainted behind the applied stars. (Not an astronomer among them apparently!) LOL I love combining my art with science but have learned not everyone understands the subtlety of these types of design. My eldest son and his bride chose a navy and cream design they found on Pintrest . The finished top was machine quilted with hearts and curly-cues. It is to date the largest quilt I've made, a king stretch quilt with an 18" drop on all sides. She's a free cut shape, and seems at home being impish on her tree branch. About 45' tall I think she's the prefect blend of tomboy and princess. She should have a name. Any suggestions? Hand pieced and quilted over many years, this queen-sized quilt puts a different spin on the traditional method of assembling. 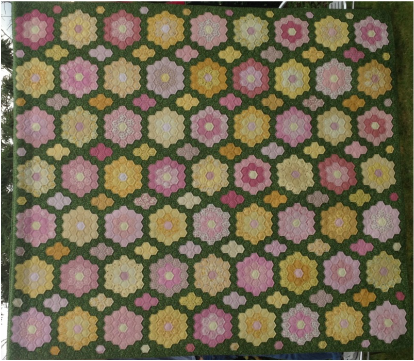 By adding components between the 'flowers' and adding individual hexagons along the edge the finished quilt is able to be completed squared instead of having those odd shapes one often sees. My elder daughter claimed possession of this before it was quilted, however between age 3 and 18 her tastes changed! Methinks it will live on my bed for now.